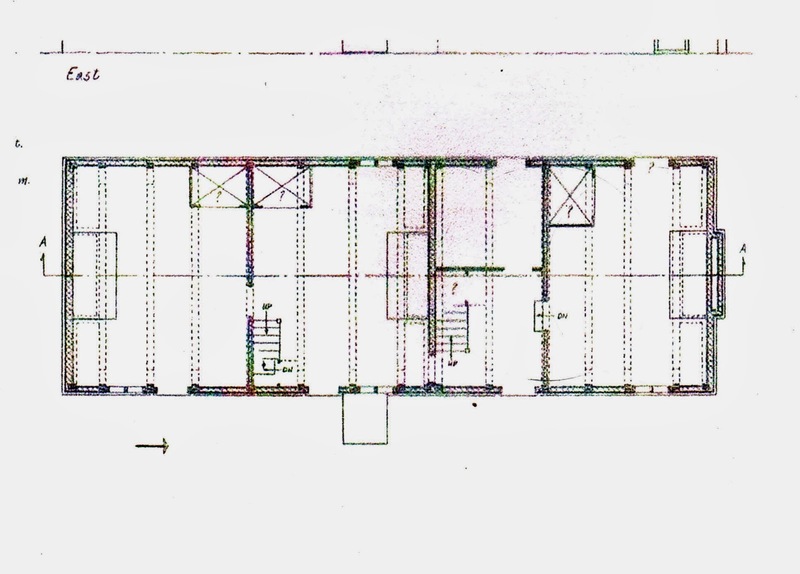 In January and February, 2012, I wrote about the geometry of the Luykas Van Alen House. The daisy wheel of circle geometry fit the plan and elevations - mostly. The right hand side didn't work. Or rather, I didn't see a consistent geometry. To see the earlier posts, search using 'Van Alen'. Since then I have toured the house twice. Once arriving early, I had a private tour with a knowledgeable docent. After the tour she handed me a 2" thick report on the house and left me happily engaged as she gave the next tour. 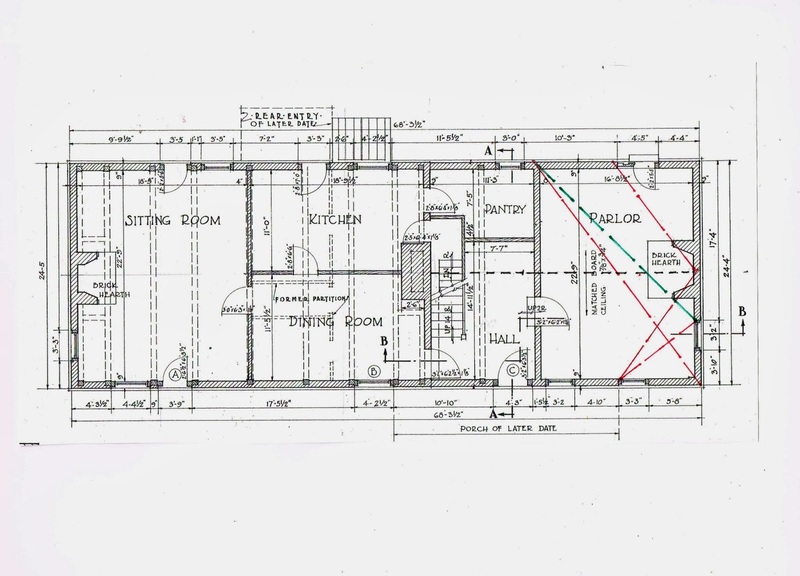 The house has been measured at least 2 more times since the HABS documentation in 1934, and the field notes of Gerald Watland and MC Hopping in 1958. Each time the chimney configuration on the north end of the house - the right end in the drawings - is slightly different. Recently the exterior chimney visible in the field notes has been removed along with the English fireplace. The drawing here is from Watland and Hopping's field notes reproduced in John Steven's Dutch Vernacular Architecture in North America, 1640-1830. Note that it shows a traditional Dutch fireplace whereas the HABS drawing shows the later, remodeled English fireplace. Where might the original wall have been? I have 2 suggestions. Both are shown on the second drawing. 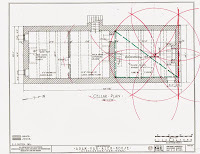 1) The circle geometry - shown in red - used for the first wing (see Part 1) if rotated 90* could have been used to determine the north foundation wall before the firebox was rebuilt. 2) A 3-4-5 triangle - shown in green - might also have been used. It fits quite well. The family history says the north wing was added or rebuilt to be living space when the son and his family joined the father. If the foundation was already here, as shed space, then the fireplace and flue would have been added to the existing masonry. If the wing dates from the arrival of the son, the questions are: How did the builder make it square? How did he fix the proportions when the left wing was already there? To use the same circle geometry he would have had to set the radius. He could have done that by locating the center of the circle from the corners of the existing foundation. The length of that wall is the radius. Or he could have relied on the 3-4-5 triangle to get his corners square. Once the foundation is in place the next step is the first floor framing. 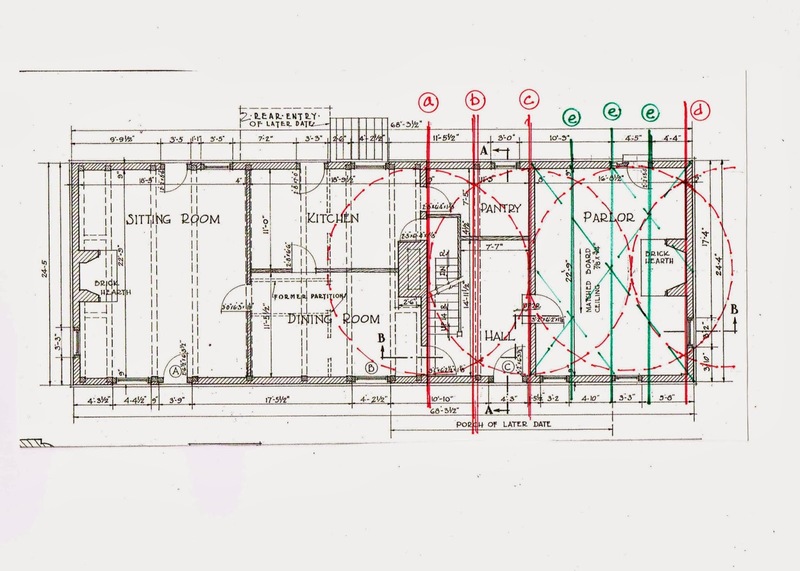 Shown in red: The circles based on the interior width of the house determine the wall between the hall and the parlor, the north wall and the location of the floor beam in the hall. 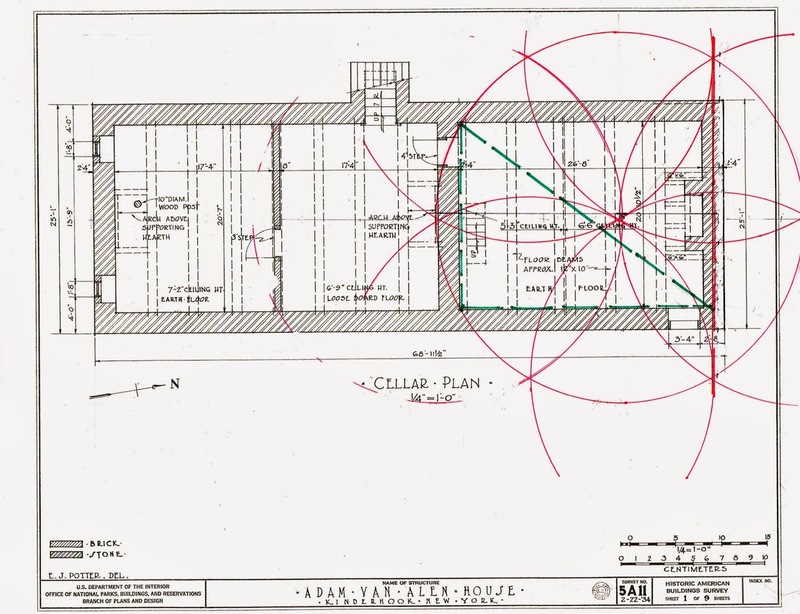 The center lines -'a' and 'c' - locate the wall between the left and right wings and the wall at the parlor. The intersections - 'b' and 'd' - locate the hall floor beam and the edge of the exterior wall. Shown in green: -The parlor needed closer framing. The space, a 3-4-5 rectangle, is divided in 4 parts which determine the beam locations - 'e' . Here the 3-4-5 triangle determines the size of the space, the location of the windows and door, maybe even the depth of the side walls of the English hearth. That may be later. If so not a valid dimension. Here the red lines show the 3-4-5 triangles, the green: a right triangle (half a square). The dotted black line is the center line through the wing.